Louise Palmer provides managerial support to ensure that the Centre's work streams are planned coordinated and delivered. 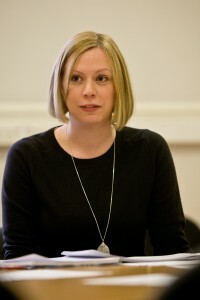 She has overall responsibility for programme and project management, marketing and communications, and business affairs. Additionally, she oversees the administration team which organises the Centre’s professional development programmes, research, events and exhibitions. Louise worked for OCR Examinations and Hays Executive recruitment before joining the Institute of Education. She has worked at the university since 2008. Louise initially began as Research and Consultancy Coordinator, supporting projects in the Faculty of Children and Learning. She later became Business Development Coordinator and was part of the original team that established the IOE's Business and Enterprise initiative. This new initiative aims to maximise the long-term financial contribution of research, consultancy and knowledge transfer activity at the Institute. Louise set up new systems and worked with colleagues across the IOE to respond to national and international project funding opportunities. In October 2012 Louise joined the Centre for Holocaust Education as Operations Manager. A major initiative for 2013-14 has been the development of the Centre's new website launched in April 2014. She continues to oversee the website and other vital aspects of our ongoing communication with teachers.